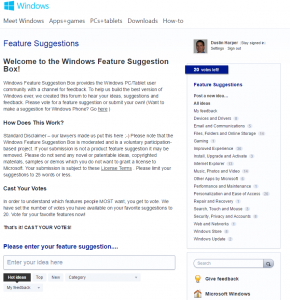 Microsoft has a new way to suggest ideas, features and suggestions for Windows – Windows Feature Suggestion Box. Using User Voice, it allows you to submit feedback for Windows. Users get to vote on the best submissions and Microsoft will look at the highest voted suggestions and see if they can implement them in a future update of Windows. Users get 20 votes to start and can vote 1-3 times per suggestion. When you are out of votes, you can take away from previous voted suggestion. If a suggestion is added into Windows, you get those votes back. This is used for suggesting features and not for submitting bugs and errors to the Windows team. Windows Phone has a similar User Voice available, and I have voted on and submitted several ideas over the years, and many have been implemented. Microsoft does listen and take these suggestions seriously. It is a nice feeling when you suggest a feature and people vote on it. Seeing that feature in Windows, and knowing that you had a part in getting it in the product (one way or another). Microsoft is moving in the right direction by taking a lot of input from users via the feedback tool in Windows 10 Technical Preview, Windows Feature Suggestion Box, MVP program, and other avenues. 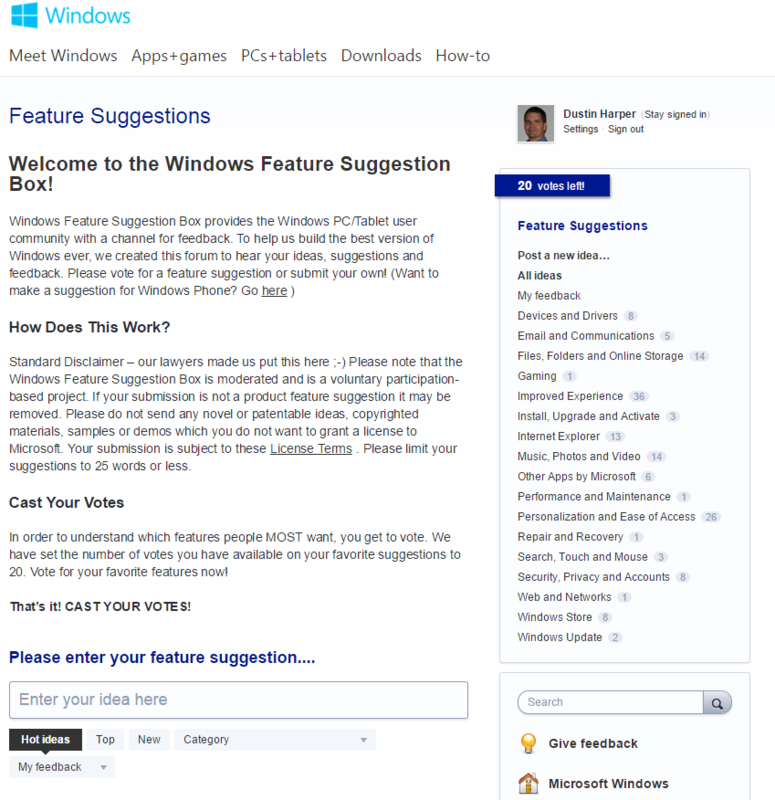 Windows Feature Suggestion Box provides the Windows PC/Tablet user community with a channel for feedback. To help us build the best version of Windows ever, we created this forum to hear your ideas, suggestions and feedback. Please vote for a feature suggestion or submit your own! Standard Disclaimer – our lawyers made us put this here 😉 Please note that the Windows Feature Suggestion Box is moderated and is a voluntary participation-based project. If your submission is not a product feature suggestion it may be removed. Please do not send any novel or patentable ideas, copyrighted materials, samples or demos which you do not want to grant a license to Microsoft. Your submission is subject to these License Terms . Please limit your suggestions to 25 words or less.